Shot several years back and shelved for quite a while until its release in theaters this past spring — where it rang up a disappointing $7 million — the good-spirited Take Me Home Tonight, a comedy about young adults in the 1980s, delivers some good laughs and a positive spirit. The 1980s-embracing Hot Tub Time Machine did much of same, which is probably what inspired the distributors to get this one into the theaters then onto disc. 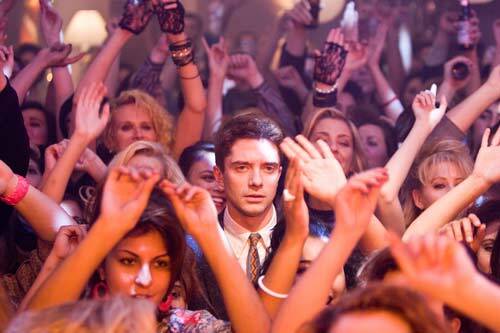 Topher Grace goes Eighties in Take Me Home Tonight. 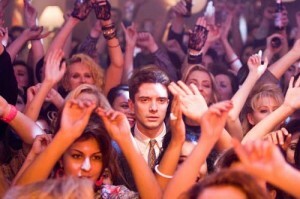 Topher Grace (Predators) stars as a college grad working in a Suncoast Video Store (remember them?) who doesn’t appear in a rush to get things going for himself until he bumps into his his former high school crush (Teresa Palmer, I Am Number Four). B.S.ing his way into a Labor Day party invite by telling her he works as a broker at Goldman Sachs, Topher meets up with his lady with his sister Anna Faris (Yogi Bear) and best bud Dan Fogler (Love Happens) in tow. Eighties-flavored mayhem ensues for everyone, highlighted by swimming pools, dancing, make-out possibilities, going all the way sessions, cocaine snorting and the challenge of rolling down a hill lodged inside of a large metallic sphere. Take Me Home Tonight is a perfectly acceptable mid-range comedy. Director Michael Dowse keeps things moving at a lively pace and the cast is on top of what they’re doing, particularly Grace (who exec-produced and co-authored the original story), the always-game Faris and supporting players Chris Pratt (TV’s Parks and Recreation), Michael Biehn (Terminator), Lucy Punch (You Will Meet a Tall Dark Stranger) and Michelle Trachtenberg (TV’s Mercy). On Blu-ray, the movie’s broad palette of colors (the purples and pinks really kick in during the party scenes) are vivid but not overripe, which must have been a temptation for those behind the machinery when they were rendering this exuberant celebration. The soundtrack is overflowing with period tracks by such artists-of-the-moment as Duran Duran, The Buggles, Men Without Hats, Wang Chung and, of Eddie Money, whose biggest hit is used as the film’s title. And it all sounds clean and well-balanced in its Master Audio 5.1 DTS-HD presentation. I didn’t even miss any of the dialog due to the music, which fills the party sequences. Well, maybe once or twice, but I can sacrifice a line or two for the benefit of hearing the immortal “Safety Dance” clearly. The modest selection of bonus features kicks off with a “Cast Get Together,” an eight-minute piece that finds the group hanging out on in someone’s living room and joking around about the shoot (which must have concluded a few weeks earlier, but we’re never told exactly when). If the cast had as good a time making the film as they seem to be having in this supplement, then it must have been a pretty fun shoot. Also included is a selection of seven deleted scenes, all of which warranted being deleted as they’re not all that funny and don’t give us any information we need to know. Finally, there’s a music video along with a “Music Boombox,” which is essentially a bookmark-type feature that allows viewers to jump to the sections of the film that are scored by the aforementioned period hits.